A beautiful modern song, Miserere sung by Andrea Bocelli and John Miles. When they arose in the morning, he said, "Send me away to my master." Her brother and her mother said, "Let the young woman remain with us a while, at least ten days; after that she may go." But he said to them, "Do not delay me, since the Lord has prospered my way. Send me away that I may go to my master." the gate of those who hate him!" When we read accounts written at the dawn of civilization (especially from a commentator with a political axe to grind), we sometimes get the notion that daughters were bought and sold like chattel. And indeed, this sometimes happened, even as late as several hundred years ago. Here, however, we see another side of early marriage customs. For it is clear that the people involved are as human as we are today, and they are attached to Rebekah. They don't want to see her go. And it is Rebekah, not simply her family, who makes the final decisions about her marriage. Most parents face the moment when a daughter "flies the nest", going off to work or attend college in another place, but today we have the comfort of visits and telephone calls. Rebekah's family has no hope of even a letter; they have no idea when, if ever, they will hear from her again. They want her to stay for ten days, to say goodbye, but she is ready to go start her new life. They all seem to have a concept of Isaac's importance, and thereby Rebekah's, a sense that she has not simply a future but a destiny. She is without doubt young enough that her age, if it were given, would raise our eyebrows. Pretty girls from prosperous families did not make it past 16 without a marriage — the Virgin Mary, in all likelihood, was 14 when Christ was born! But she seems fearless, perhaps trusting in God to keep her safe, and perhaps, partially, just filled with the excitement of youth over a great adventure in a far-away place. 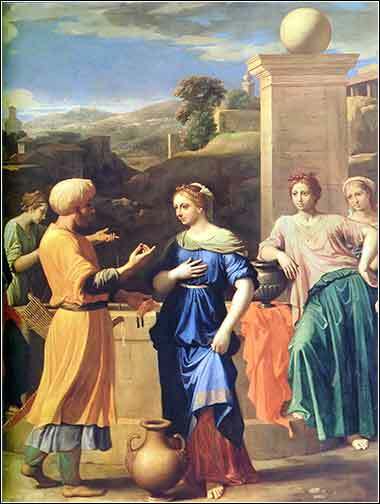 Eliezer and Rebecca at the Well,, by Nicolas Poussin 1648. Matthew 6:19-21: Do not lay up for yourselves treasures on earth, where moth and rust destroy and where thieves break in and steal, but lay up for yourselves treasures in heaven, where neither moth nor rust destroys and where thieves do not break in and steal. For where your treasure is, there your heart will be also.